The Digital Research Library of Illinois History Journal™: Downtown Chicago Restaurant Area Nicknames from the 1900s. Downtown Chicago Restaurant Area Nicknames from the 1900s. The reason restaurants group together is not hard to understand. Groups of the same kind of businesses attracted flocks of customers who knew they were likely to find something they wanted. In the early 20th century, when chain restaurants were becoming common, lesser known restaurants were eager to locate near the winners to catch their overflow. It’s also a marketing ploy. City officials declared a street Restaurant Row to help boost the local economy. Toothpick Row: Clark Street had lots of lunchroom businesses. Restaurant Row: Randolph Street where there were 39 busy restaurants within a six-block stretch. 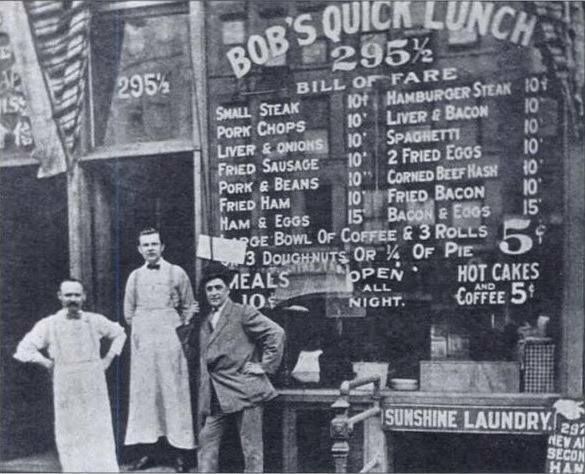 Cafeteria Row: Wabash Avenue had the largest number of self-service restaurants in the world.